iHeart Radio have lifted the geoblock on their news station in Panama City. I'm watching The Weather Channel in the UK, but can't confirm if it's because I use a Smart DNS provider or if the geoblock has been removed. Right now The Weather Channel IMO, has the best coverage for several reasons, they have more personnel on the ground and they are all meteorologists. So they know what they are talking about and not just news reporters shouting into the wind. Looks like The Weather Channel is FTA on it's website. Good to see in emergencies that it's seen as a public service, rather than making you sign in via your cable provider. Really wow. I knew NBC generally geo-blocked their affiliates. Wasnt aware the others have caught on. But it could be just the OKC affiliates. I think it's mostly the groups that take the decision, rather than it being a network/affiliate issue. I've found TEGNA stations have mostly been blocked since early this year, Tribune took theirs off around the same time. It's the whole sites thater are blocked, not just the stream. I find smaller marked independents and groups like Cox (and Sinclair) are still fine, for now. I think it has to do with a European Union law that went into effect earlier this year - something about dealing with websites. It could also deal with rights restrictions on content. Additionally, ALL Panama City Radio and TV stations have gone off air. WJHG/WECP NBC/CBS duopoly went off air as their STL (studio transmitter link tower) crashed outside their studio and their roof was starting to rip apart. ESPN Radio 104.3 WGSX was also knocked off the air when their master antenna on the WJHG/WECP tower crashed. The WGSX broadcast facility lost part of their roof, taking on water and satellite dishes were getting damaged. Nexstar ABC affiliate WMBB is off air as their power went out and back up generator failed. Cable TV viewers and viewers online are seeing coverage from their NBC sister station in Tampa WFLA and CBS station WDHN in Dothan, AL. The iHeart Media Radio cluster is off air locally as their STL tower crashed as well. They are now apparently taking a feed from their sister station in Tallahassee (which is also in the hurricane zone). To make matters worse for them, they’re trapped as water is rising and completely surrounding their facility. Powell Media which owns four radio stations are off air as their tower bent over but apparently the antennas are intact. Magic Broadcastings four station cluster, and public news / talk radio station WKGC are off the air but it’s unknown why. All of this is paraphrased/summarized from this Radio Insight article which has embedded Facebook posts along with videos. How sad for the news media in the panhandle. Just trying to do their jobs to inform the public. Hope fully they can get up and running again. In disasters like this the local media is a valuable resource. Was getting a bit confused there until I looked op 'Panama City'. WFLA are still providing a special service for those sister stations in the Panhandle and Georgia who still can't get on-air. They're using a part of the building with a fixed camera next to the gallery. WFLA itself is running a normal service for Tampa. 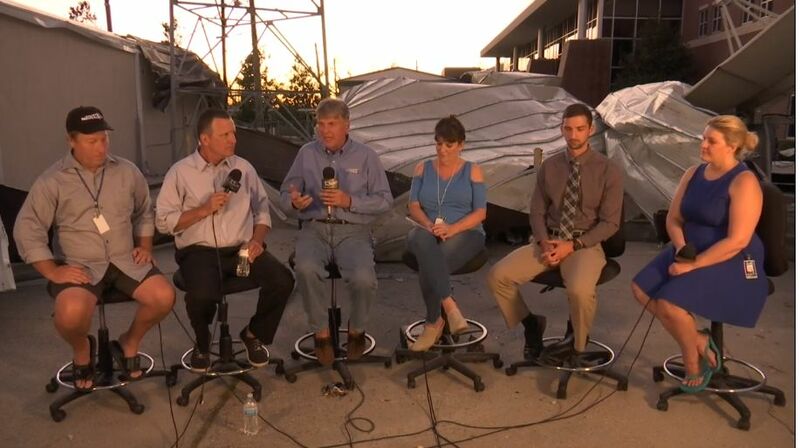 Kudos to WMBB in Panama City who have managed to get on-air today on their website and Facebook today (courtesy of WLFA) where the main anchors and meteorologists are discussing yesterday's events. Wow that was a interesting find WWUpdate. I dont I think I've ever seen Tornado Alert on tv from another country outside North America. Of course North America is known for tornadoes and I realize Australia has pretty nasty weather from time to time, but I was mildy surprised they didnt stick with the meteorologist and had him track it in some rudimentary fashion. But looking at the radar they use (in which he was pointing out the hook echo) is seemed pretty old fashioned. Naturally he was using the Radar provided by the Australian BOM and it clearly has limitations such as lack of a roadbase and it clearly was on long delay. (No im next expecting them to have to the same kinda of tools that are used in US Broadcast Meteorology) It reminded me of the US NOAA radars from the late 80s early 90s. But it was good to see they were trying to warn viewers. I wonder what kind of on screen warnings they provided for the damage that was caused earlier as shown in the broadcast. I wonder if they run banners with an alert or do you have to wait till they are in a regularly scheduled newscast? I do think they should have left the warning aston on-screen the entire time especially as they were talking about the weather, or maybe a box in the corner that rotates the locations of the tornado or something. Just in case someone tuned in and had no idea a tornado was in the state. And I dont think it was necessary for the news presenter to have such a long intro. She could have simply, welcomed the viewers, mentioned the BOM issued a tornado warning for specific community and immediately tossed to the meteorologist. So he give out the specifics of the warning location. And then after he was finished then they could have done a rundown the rest of the problems caused by the previous storms. In any event well done to Ch7 for their work. It seems like that warning sound is standard alert noise used on radio and tv and can be played our by the broadcaster when an official alert has been issued. They also use the same noise on the outside sirens in the major cities such as the test heard in Sydney on the CBD warning system. This similar to the warning sirens used across US accept they are pretty much everywhere there is a population. Didnt know anyone else had these.